I spoke last night at Prayer Meeting and Bible Study. The topic was "Standing up to the King" and I was to use Samuel the Prophet as an example. I skipped through the life of Samuel to illustrate his Bold Service to the Lord through his Prophetic Ministry. I scream and cry, and wonder why you never seem to learn. To hear with your own ears, with your own eyes to see. I am The Prophet, won't you listen to me? This gloomy outlook is sadly accurate. Prophets tend to take God's word and use it to reveal to the people how far short they fall of God's standards. People don't usually like that message. As a result, the prophet is rejected, scorned, ignored, and sometimes even persecuted. But the prophet's job is to remain faithful to The Lord and deliver His message to the intended target. prepare the way for the new Kingdom of God, which Messias was to establish on earth.See full definition. As can be deduced, The Prophet's role is more than simply prophecy in the lay use of the word—that being the act of predicting future events. In fact, only one-fifth of this definition foretelling deals with that element. The rest of the definition deals with community development in the form of preaching, upholding the law that had already been delivered to the people, and leadership. The Prophet was to illustrate a life that was pleasing to The Lord. It is commonly held that the foretelling aspect of prophecy has ceased. We have a complete record of scripture and no longer wait for new revelation from God. However, it seems clear that the other elements of the Old Testament Prophet can apply to The Church, so a study of the lives of The Prophets can be beneficial to Christendom. There is one last thing to keep in mind. We need to remember that Prophets (and people in general) operate on several different planes. We will see that this is true in Samuel's life. He operated on the Corporate/Individual plane as well as the Public/Private plane. I call this The CIPP Matrix (pronounced as "sip"). At least, I'll call it The CIPP Matrix untill I find a better way to describe it. The Corporate Plane refers to Samuel's obligation to Israel as a nation. He constantly addresses the nation as a corporate entity. To have a ministry on this plane is the rarest of circumstances and not everyone has this opportunity. Personally, though many around the world read this blog, I never stop to consider myself on this plane. 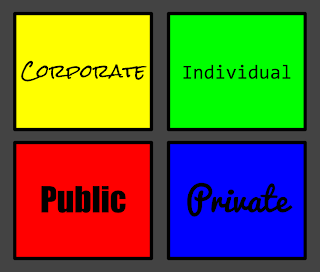 A corporate ministry is defined by a distinct mission for a distinct audience. Good current examples of individuals who have Corporate Ministries would include Dr. James Dobson, Rick Warren, and Max Lucado. Or you could look at your Christian bookstore, all these authors have Corporate Ministries. The Individual Plane refers to Samuel's ministry to individuals. He personally dealt with Eli, Saul, and David. Note that these individual ministries were not cold, heartless, bible-bashing campaigns. Scripture reveals that Samuel was heavily invested in these individuals and went to great lengths to help them succeed. He also grieved intensely when they failed. All Christians that come into contact with people will have individual ministries. The Public Plane, while similar to corporate ministries, is differentiated by the lack of a distinct mission. The focus of the mission is replaced with the general command to allow your public choices to be influenced by God's will. These are the things you do in front of other people. I defer to Christ's words, when tells us to let our light shine before all men. Needless to say, this is not limited to a select group of Christians. The Private Plane is also unique since this refers to the areas of your life that are only available for inspection by God and yourself. What is in the seedy underbelly of your thoughts and intentions? Even though others cannot see this part of your life, it is still important to God as it affects your relationship with Him and, in turn, will affect the rest of your service. I understand that this post was a very technical study of what constitutes a prophet. Clearly, every Christian should be equipped to declare God's word even if they do not have the "gift of prophecy." I relate it to the argument that all men should evangelize though not all are especially called out as evangelists. To be honest, people get hung up on titles too often. What should happen is a consistent upholding of God's word in the face of a sinful world. When we reflect the light of divinity, the darkness of humanity will be exposed. I plan to follow this post up with the meat of last night's discussion. Consider this the framework which I proceed with the discussion of Samuel The Prophet. Let me know what your thoughts are in response to this post, I would love to learn. Also, if you have a better name for my CIPP Matrix, please leave me a comment. I thank you in advance for your creativity.